Luke wanted to know what Street Art was all about. So he asked Bash to take him with him on the street to teach him. "Street Art isn't something that can be taught! You are the art..."
Bash took Luke to a wall and asked him to stand really quiet and close his eyes so that Bash could explain what he meant with "you are the art". "Now you can finish the outline for me." Luke opened his eyes and finally understood... he IS the art! Even with the small bit of added sculpt, the design is a little on the simple side for the price point. For reference, an available piece that is much more involved sculpting and paint-wise: Bert the Beaver and his Wooden Labbit Home is selling for 250 Euros plus shipping. 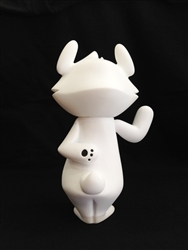 Keep in mind that the Bert the Beaver custom involves 2 figures, a 10" labbit and micro Munny, both of which are painted and sculpted pretty well. "Luke is Street Art" is priced at 300 Euros plus shipping, depending on location. With Bash being based in the Netherlands, shipping to US will run collectors 26 extra Euros, for a total of roughly $436 USD. Factoring in the price of the initial figure, pricing for this piece should have been somewhere around $300 USD plus shipping. That conversion rate will bite any US collector trying to purchase a piece from an overseas artist. 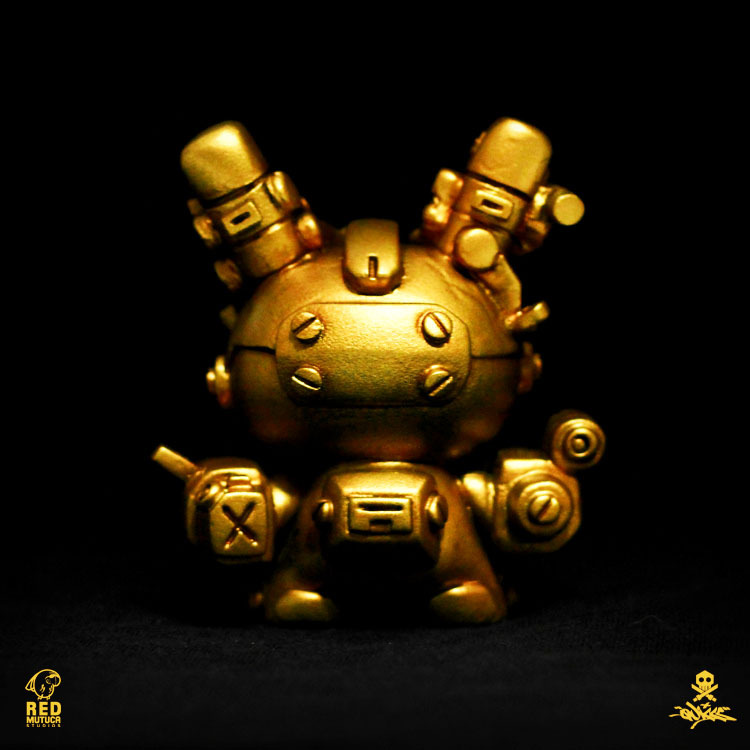 Bash does have many other pieces available as well, including several smaller Dunnys. The head is a modified nozzel squadt with a handmade body (fully moveable). Forces of Dorkness (Scott Kinnebrew) and Myself (JFury) decided to do a sculpt and swap. So we both went at 7" munnys with some super sculpey, then we painted each others sculpted custom and I think the results are great. These two wonderful custom will be available at my webstore www.furiouscustoms.bigcartel.com. Monday 8/19 at 6 pm pst and a great price of 150.00 each. The first two pics are Scott sculpt and my paint. The Second two pics are my sculpt and Scotts paint. Amazed by the sculpting on this Dunny. Those ears are something else! Hand-casted for a very limited run to give people the chance to own and enjoy one. Assault & Batteryz is a custom concept I built that revolves around a heavily armed Mech (aka "Assault") and 2 support robots ("Ruff Battery", the Rocketeer) + ("Tuff Battery", the Rifelman) sitting on its head, individual characters as seen on "at_ease_sticker.jpeg"
The main idea for me way to present the 3" Dunny figure in a way that has never been done before (so far as i think), utilizing the signature ears as mini characters sitting on the head, while keeping my signature Bulletpunk mech design in it as well. This custom is detailed to the teeth, as seen all the way till the back, as it is the most detailed one I've done on a 3" figure to date. Good to see BALD back at the customizers front. 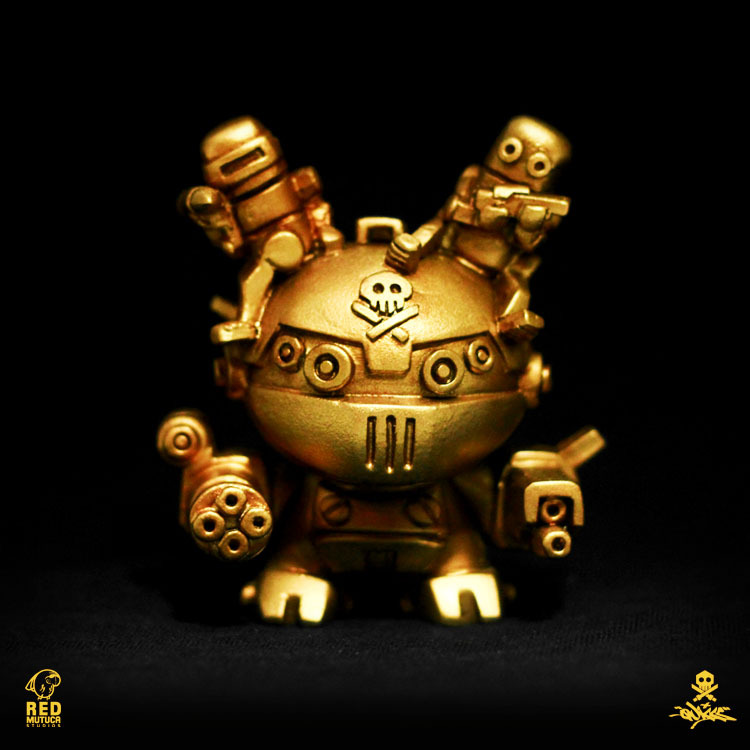 Love this Tequila and his own resin figure looks epic! Ivan Ivanoff aka The Great Russian Bear was a famous wrestler that got in deep with the mob, eventually leading to his ban from wrestling. Now Ivan is a mindless enforcer for the mob, he continues to wear his costume refusing to wash it or take it off and uses to intimidate those unlucky enough to cross his path. 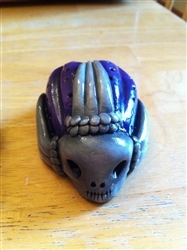 My first original resin toy, Minus Mouse! 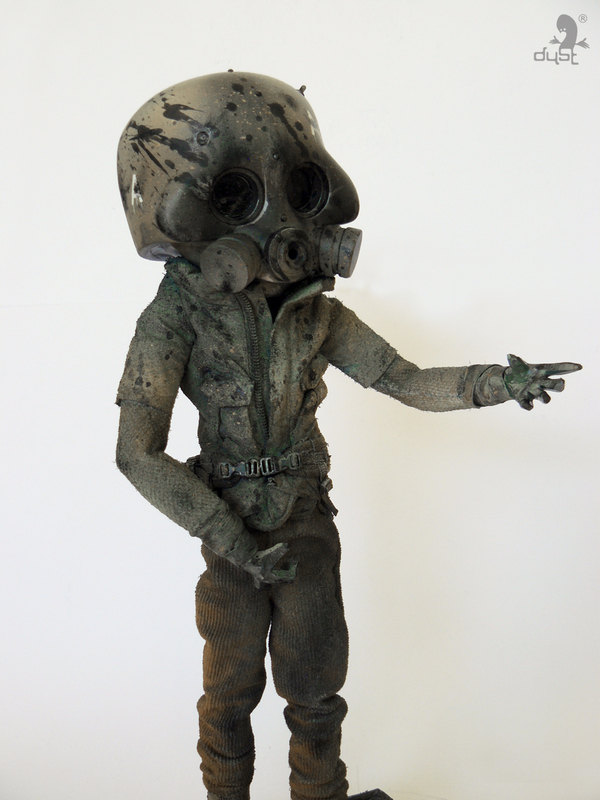 He stands 4" x 3" tall, comes bagged with header card and custom sketch. Limited Edition of only 7 hand painted originals. 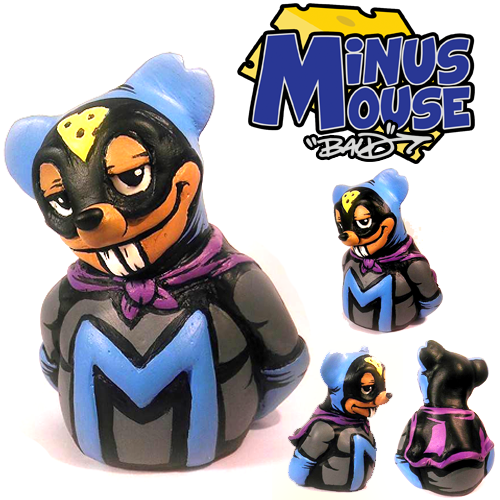 Back story: Minus Mouse is the reluctant and somewhat disturbed defender of Cheeseville where he fights against crime and mouse traps! Greg "Craola" Simkins is teaming up with the folks over at 3DRetro to bring Ralf, the White Knight, to vinyl life. Ralf is the main character in Craola's future stop motion animation, which he and C4toons is currently running a Kickstarter for, in order to raise the base funding for the project. 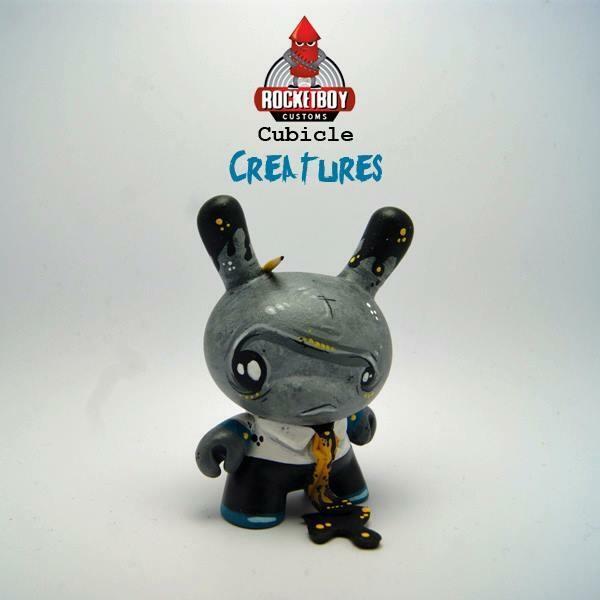 Craola is not new to the vinyl toy world, with his work appearing on several production toys, including a line of his own characters. From the very beginning of the Kickstarter launch and even with the teaser pics posted by Craola, collectors have been hoping for the chance at the possibility of a vinyl toy of one or more characters set to appear in the Mook(term coined for this project to mean Movie and accompanying book). 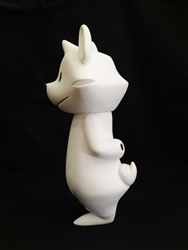 It appears that Ralf(and hopefully more characters) is going to be a vinyl toy which everyone will be able to have and adore in the future. Even as a rough concept, the implications of what the final product will look like is fantastic. This could be the first in a line of characters from the future "I'm Scared" movie. 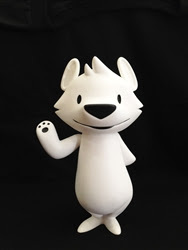 Creating something like Ralf the vinyl toy is a huge undertaking, especially from a drawn concept, which was created for a project that is still in it's early stages. For many, the assumption is that the process to create a toy from concept to final product is something simple and the prices should reflect that. What many people should understand, is that in order to make most toys viable and affordable, multiple colorways is something that will always be discussed. 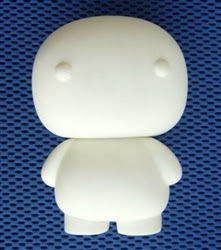 Having a single colorway edition of 1200 for any vinyl toy is something that is not always the best option, especially when it comes to designer toys and the small niche it represents in the grand scheme of all things considered art and toys. With all that said, the "I'm Scared" Kickstarter is going to be the only way for collectors to score the exclusive Kickstarter colorway. The "Rancid Ralf" pledge level has 100 available rewards with a pledge level set at $65 or more(which includes shipping within the US). 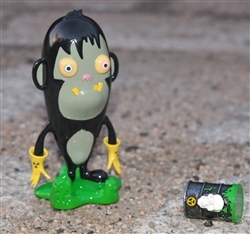 The "Booogey Monstah" pledge level of $100, offers both the Vinyl Toy Ralf and the Mook, with only 50 available rewards. Both levels combined means that the Kickstarter edition of Ralf is currently set at 150 units. This Kickstarter opportunity is a great way for collectors to score what should be a rare piece, while also saving a bit of money and supporting a wonderful project. As of this blog post, only 11 days remain and the project is only at 69% funded of the total funding goal of $65,000. Hopefully, more people will pledge in the next few days, snagging up these newly added rewards. If you haven't done so already, please make a pledge or just spread the word to everyone you know. Spreading the word is just as good as pledging. Let's all make "I'm Scared" the movie happen! 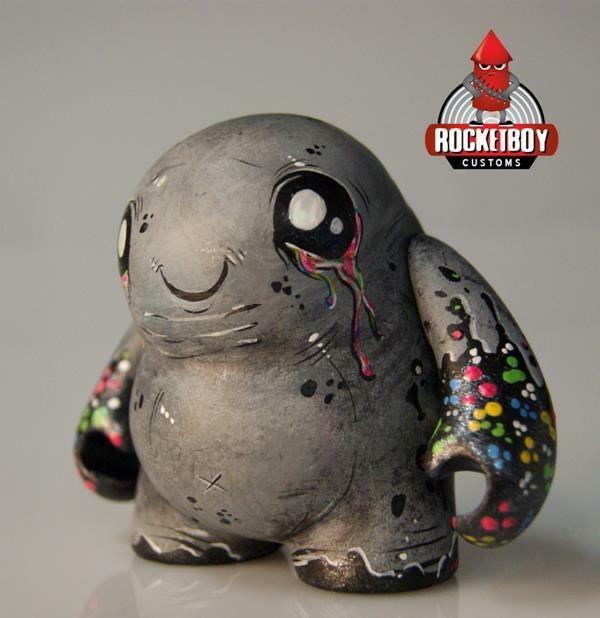 JFury's Sticky Ricky was a popular figure in the ToyKick Fresh Batch 3" Dunny blind box series. 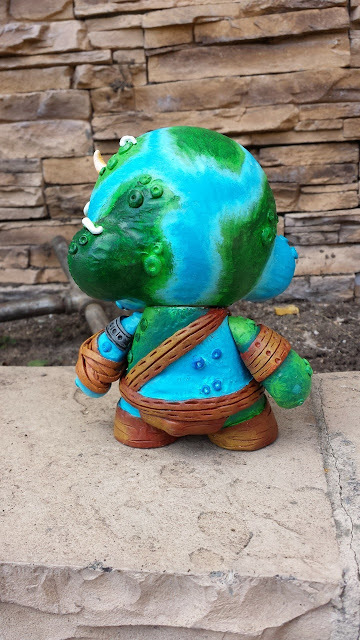 So popular that he's been asked to do an 8" Munny version. And here it is! Whereas many of the facial features of the smaller figure were hand painted in, JFury was able to sculpt on those features thanks to the larger platform giving an already excellent figure even more depth and detail. You can find more of his work at his store, including resin pieces and custom vinyl. Inspired by the seemingly steroid-induced muscular design of the new BMW X6, Mike Calboni took that vision to the extreme and created his new resin piece, MUSCULAR. 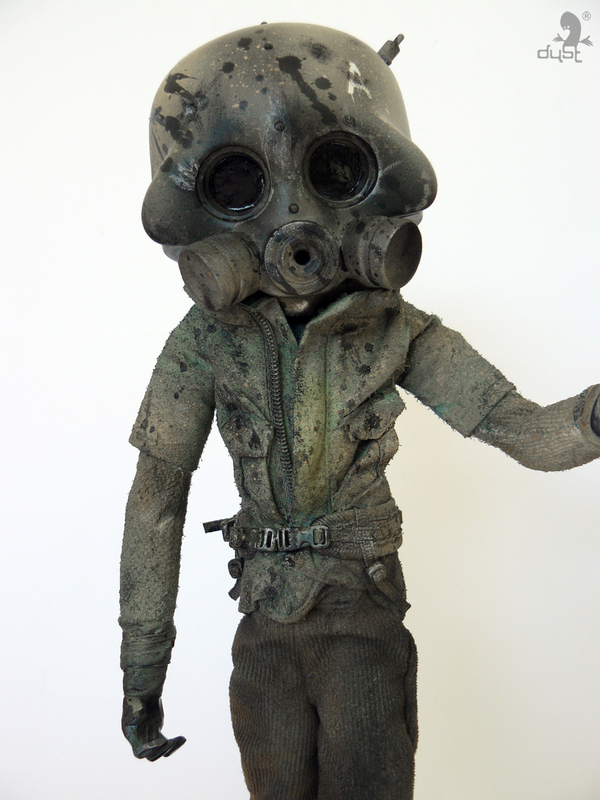 Looking like a twisted fusion of man and machine MUSCULAR is a 6" hand sculpted, cast, painted and signed resin piece. Each figure comes with it's own soft drawstring pocket featuring printed images of MUSCULAR on the outside. You can find MUSCULAR at Mike Calboni's shop here. Music to My Ears is a group show curated by, now teen, Super Cooper Berella. 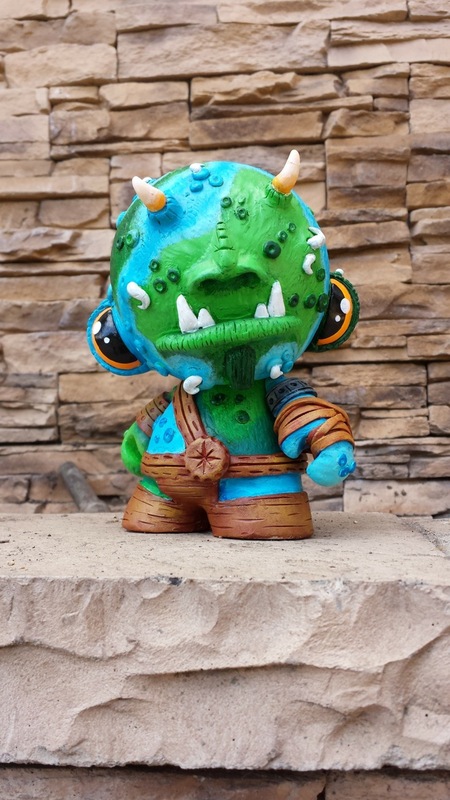 A yearly birthday celebration and art show, previously held at the Munky King retail store, is opening at Toy Art Gallery in LA on August 24th. Every year, Super Cooper manages to gather a great group of artists to create both 2D and 3D pieces of art, all around a unified theme. This years theme revolves around the influence of music to each artist, or his/her interpretation of the term "Music to My Ears". It's not uncommon for artists to post a picture on Instagram/twitter/vine/etc, while also commenting on the music he/she is listening too, zoning out to whatever genre seems to fit with the current mood. Super Cooper is going to be 14 years old and in the past few years that I've known about him, his passion for art in general, never ceases to amaze me. While the young Super Cooper is an already accomplished curator, Super Cooper is also a budding artist and avid collector, with his collection being a finalist for 2013 Designer Toy Awards. If that wasn't enough, Super Cooper is also a philanthropist, with some proceeds for his curated shows typically getting donated to a charity or two. Proceeds this year will benefit CHAMPS and Book Bridge. 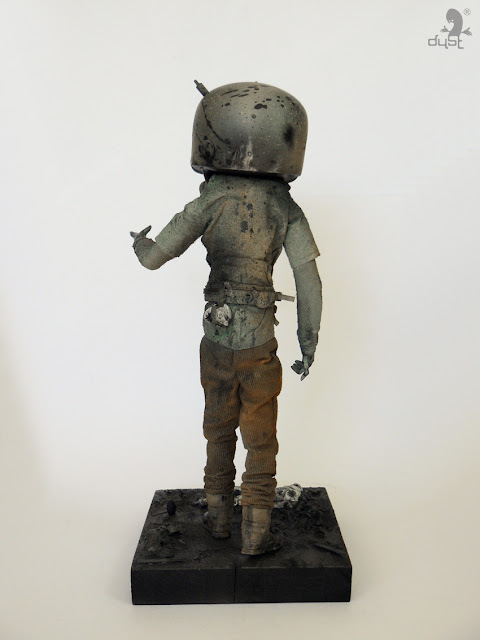 For anyone who can make it, the opening reception will happen at Toy Art Gallery on August 24th from 7-10PM. The show will run until September 10th and many local artists are sure to be in attendance. It'll be a great party, so arrive early and hang out with all of those in attendance. After a successful initial release in May, the "Galactic Empire" T-Shirt designed by Sket-One and produced by Silent Stage Gallery, is back by popular demand. Customers are once again going to have 1 week to pre-order the T-Shirt, starting August 22nd and closing August 29th, on the Silent Stage online store. The Galactic Empire shirts are available in sizes from small to 3XL, in both black and white T-Shirts. The California flag inspired Galactic Empire design by Sket-One is featured on the front of the tee, while the Silent Stage logo appears on the upper back of the T-Shirt. Not ones to ever limit available colorways, Silent Stage and Sket-One are also released a grey scale colorway of the Galactic Empire T-Shirt. Pre-order for the grey scale T-shirt is available during the same time as the colored version. Both t-shirt designs are going for $25 plus shipping and handling. Be sure to pick up one or more of these t-shirts in the Silent Stage Shop while you can because there is no guarantee that this design will ever be made again(unless a new colorway gets produced or if demand warrants bringing it back). 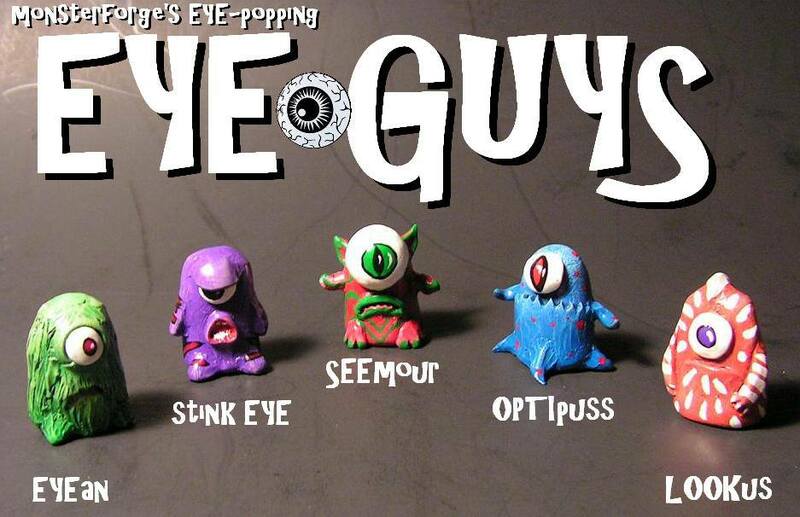 MonsterForge announce via Facebook their new hand sculpted and painted Eye Guys, five unique 1" figures with crazy eyes and even crazier colors. Grab a few at MonsterForge's store, just $10 each. Tesselates' B5100, the first in his BEFORE ED-IT series, is limited to just one nearly 7" tall resin figure and will be available Monday, August 26th at 8pm BST. 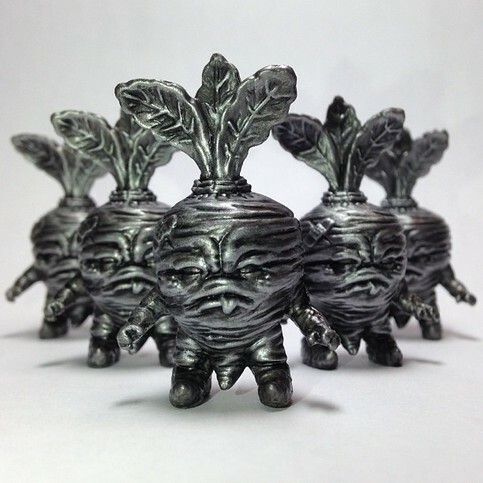 Limited to only 5 pieces, “Steelbeets” is the first of many heavy metal releases scheduled for SoKo Cat! Always ready for action, these brawny babies have the bravery and boldness of beets twice their size! Don’t tread on these mean dudes or you’ll be sorry! Steelbeets are available for purchase in her store for US$25! 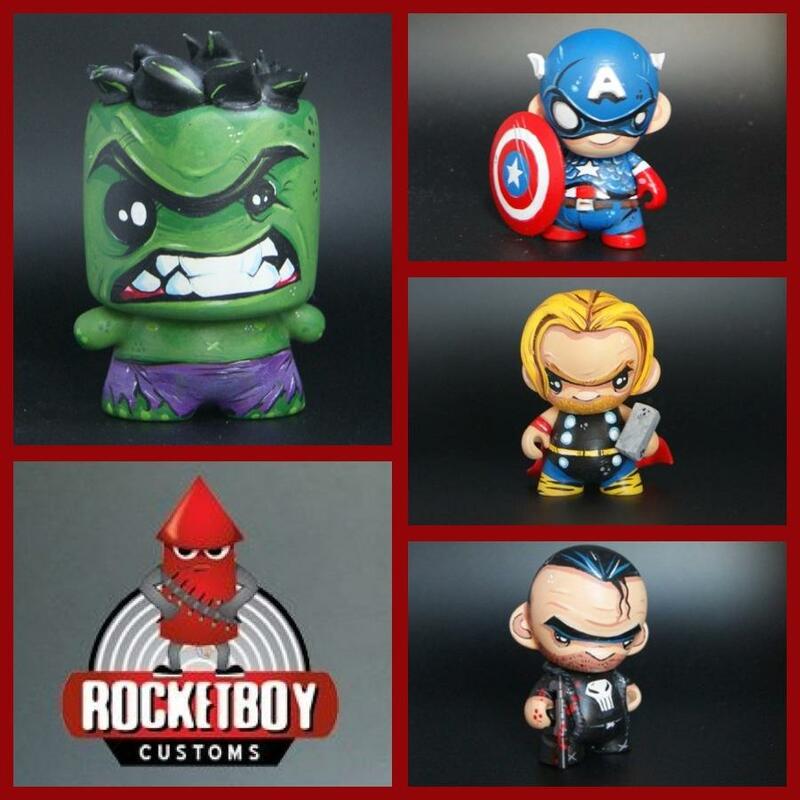 Each piece stands approximately 1.5 inches tall and is hand painted using acrylic paint. Hand signed and numbered by SoKo Cat! If you'd like to know more about SoKo Cat, you can visit her blog , follow her on Instagram , and check out her store! 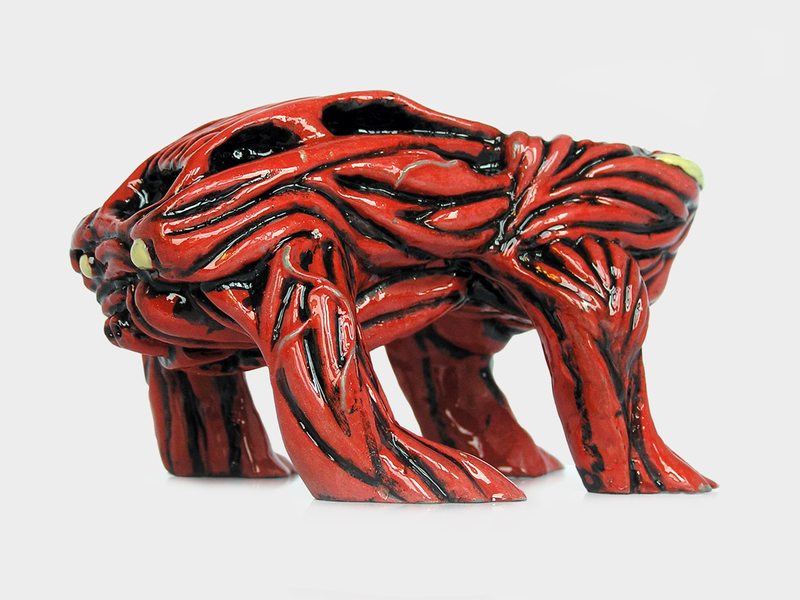 This piece is one of a series of resin Mutation 4L60 figures made by our youngest artist, Jacob JAMS, and sent to Davemarkart (Dave Webb) for customization. 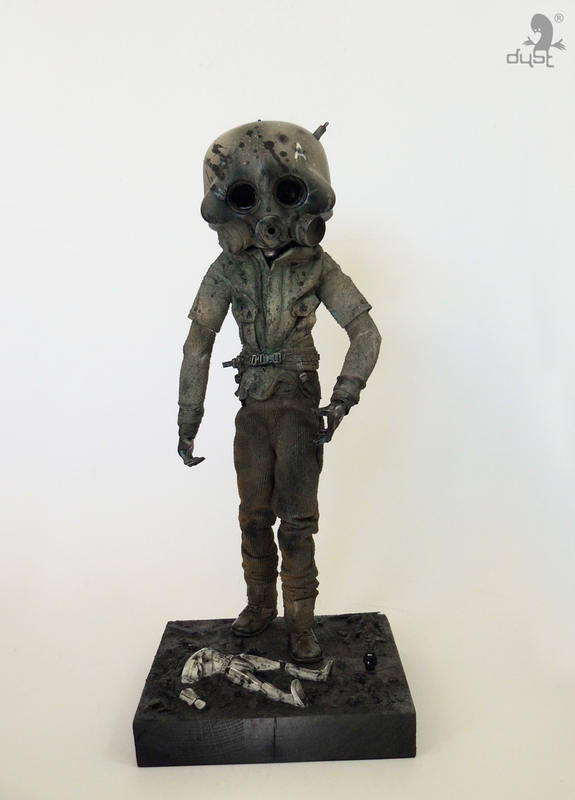 This is a one of a kind custom: hand-cast resin, custom sculpted and hand painted.The piece is 3 inches longand available now for $60 on the Tenacious Toys online store. 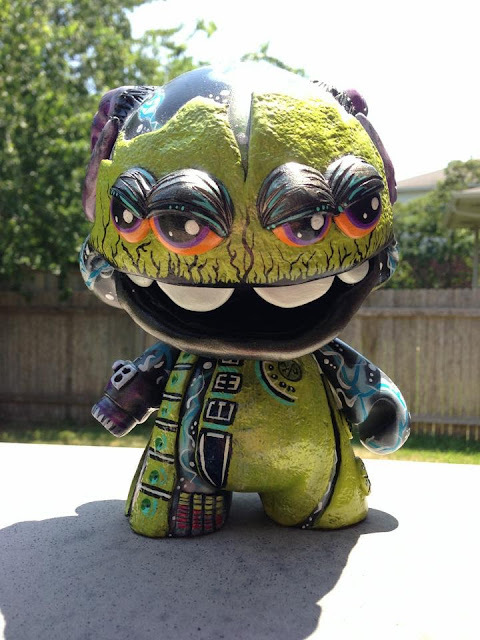 Small Angry Monster's latest piece, Frankenbeet, is a custom 7" Deadbeet by Scott Tolleson and George Gaspar. 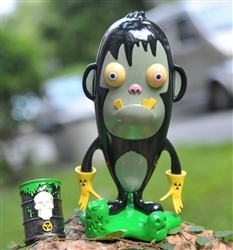 Customized to have a steam punk feel, complete with metal drip pipes and a gaping mouth, while the paint job on Frankenbeet really makes the figure zombified, without over doing it with blood and guts. One of Frankenbeet's eyes has been replaced with a steam punk lense, teeth added and even the fronds have been replaced with exhaust pipes. The overall execution on Frankenbeet gives the custom a nice feel and should make a great addition to any collection, especially a Deadbeet collection. 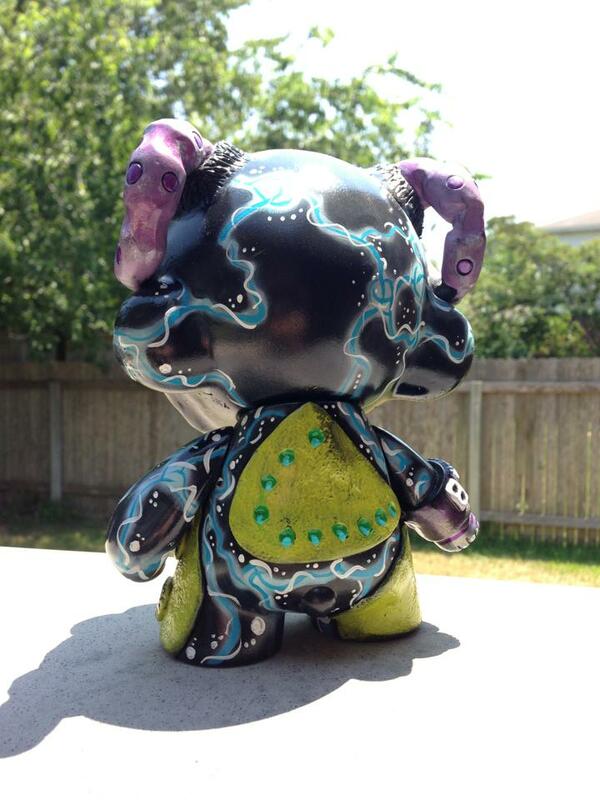 Selling for $180 plus shipping, Frankenbeet is available immediately from Small Angry Monster's store: Monsters Lair. Gorgoloid is back on the scene after settling in the new studio in Portland, OR. Gorgoloid is a brand which features the art works of Barry Allen. 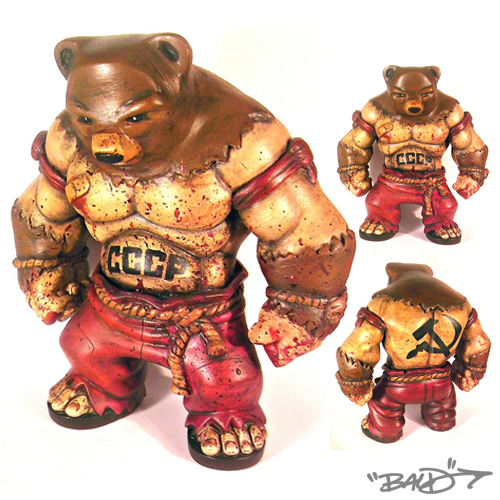 Barry and company, Gorgoloid, have decided to release their first wave of Kaiju figures called Rhaal. The Rhaal are amphibious giants from unknown origin who seem to be guardian elementals protecting their various regions from mans poisonous touch. Unmerciful and virtually unstoppable they crush all in their path who would harm their homelands or threaten the fragile eco-systems they seem to be rooted in. The Rhaal range from mild temperament to ravaging beasts and have begun to garner a cult following who worship them as Guardians of Gaia. Eco-radicals and green washed warriors praise the Rhaal rampages and insatiable rage. Our weapons have thus far had no effect on the roving monoliths, humanity can seemingly do nothing but watch as the Rhaal take back the lands for themselves and the creatures. Commercial boats treading their waters are cracked like bird bones, fishing communities and hunting grounds are leveled in a night. Retreat and avoidance from the Rhaal's territory is the only option. Standing at 5 inches tall and made of 200 grams of resin, each of these 4 figures are hand painted, clear coated and signed by the artist. Each figure is selling for $85 plus shipping at Gorgoloid. As the Halloween Season approaches, I decided to take on a new look for the Lil' Jammie. 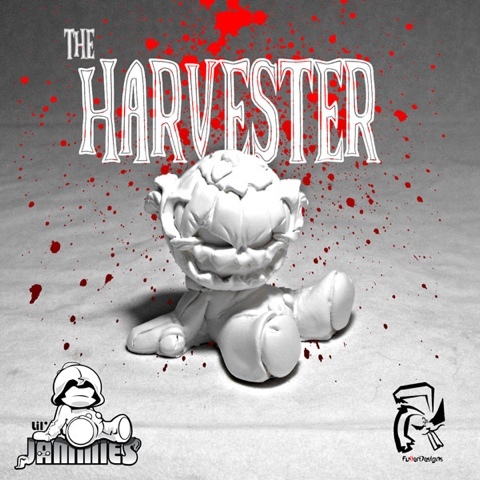 The Harvester. He is a my vision of the Evil Pumpkin Man. Great for the customizer or collector alike. he would make a great addition to a haunting collection. 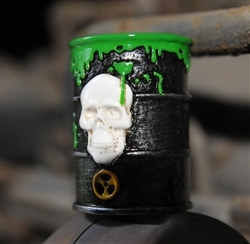 Made from sturdy resin to last. This item is limited to only 10 pieces. Once they are gone. That will be it for a while. So get them while you can. Limited time offer. Only $25 ea. "Earlier this year we teamed up with the artist Jc Rivera to create a new logo and our 'Bloggin' Bear' characters to represent Urban Vinyl Daily. Today we are excited to announce the first release in a series of t-shirts produced by outsmART originals that are inspired by these designs. 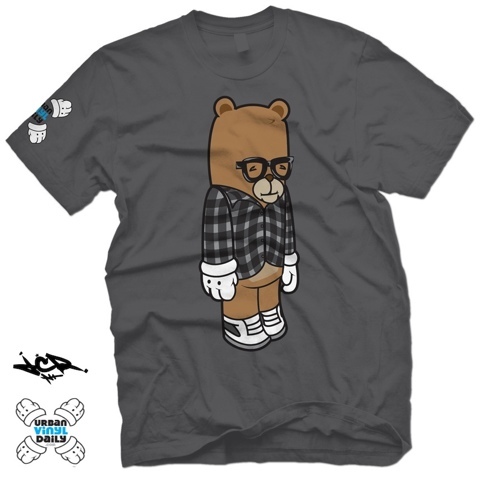 This release features Bloggin' Bear Travis sporting his signature grey flannel shirt and black rim glasses. The shirt will also feature the UVD Hands logo printed on the sleeve. These shirts will be heat transfers on grey American Apparel Fine Jersey t-shirts available in men's sizes Small-3XL. Pre-Orders will run from Friday August 23rd at Noon EST-Friday September 20th at Midnight EST and during this time we will be offering free shipping on all shirt orders. You will be able to get yours HERE for just $25 each (For 2XL and 3XL see price in store)." 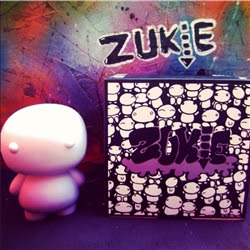 DIY Zukie is a new platform toy made of vinyl. Each figure comes with a box where you can also customize and color in the Zukies. Zukie is a chubby character who will love you! 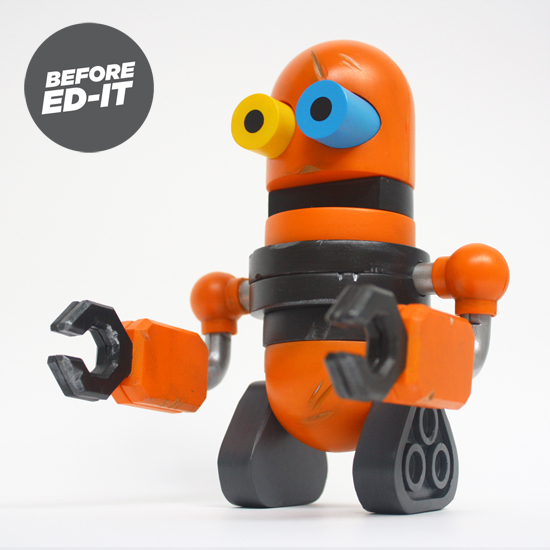 This DIY vinyl piece stands 4 inches tall and is articulated at the head/neck. 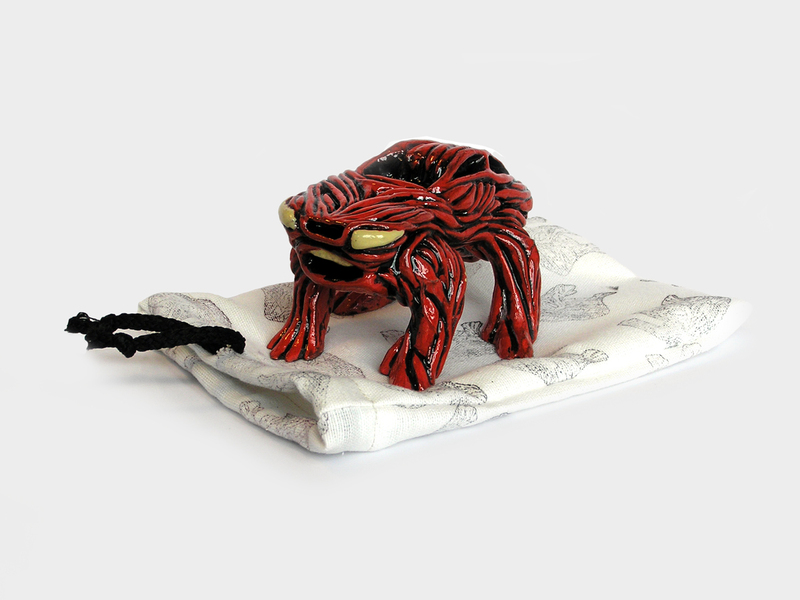 THe figure comes in art box packaging and was self-funded by Alison Perez, aka Miss Zukie! Pick one up for $12 at the Tenacious Toys online store today. 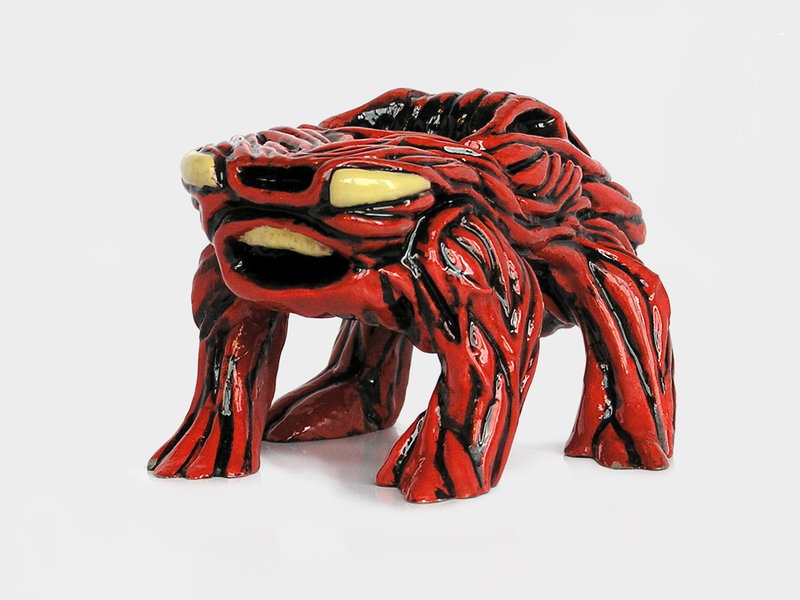 Each piece stands 6.3 inches tall and is made of resin with bamboo teeth. "Harry" is limited to only 200 pieces worldwide and is drop-shipped to customers from China. "Harry" was created by RedMakiToy and is available for preorder now for $80 at the Tenacious Toys online store. The PotD today is the Hug Life "Awesome Bear" OG Edition by Philip Lumbang. Awesome bear made it's debut during SDCC and received much excitement from fans. Standing 6" tall and featuring two points of articulation, the OG Edition is limited to only 300 pieces worldwide. This piece was designed by Philip Lumbang and produced by Dragatomi. It is available now for $50 at the Tenacious Toys online store. I am in love with this style. 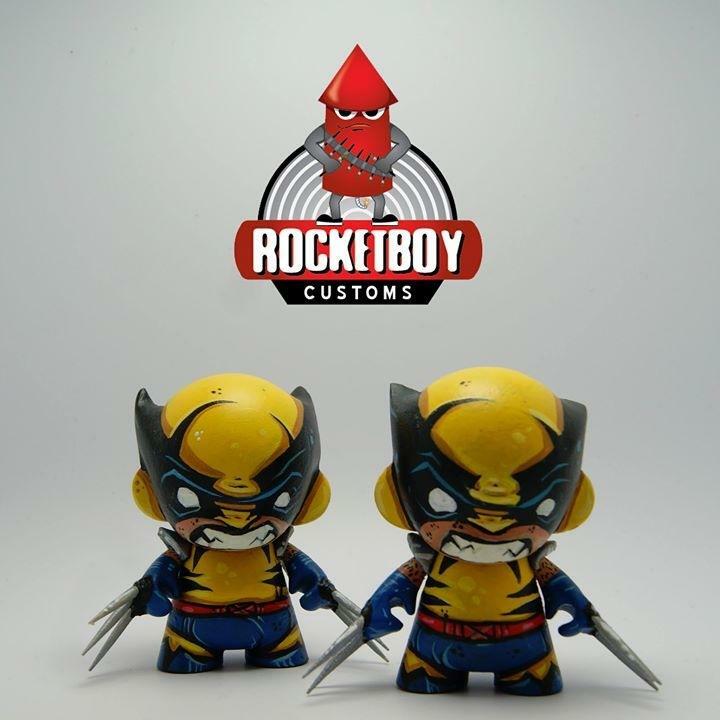 I heard that we will see some more customs soon, since Rocketboy has his own show in the near future. Andy's Threads teams up with malevolent monster maker Deth Becomes You for a ghoulish release- Steam Punk Andy Tshirts! The Tshirts are up for Pre-Order here, for 25$ea. The custom inspired an inked lineart piece. While primarily a 3D Artist, Deth's lineart effectively renders the skeletal and mechanical undertones of the original custom.